Wow! DUCC is just a few months away! I can’t believe we are so close! We hope that the transition to our new registration system has been good for you and the families of your churches. I appreciate the patience and grace that has been given to the regional office as we live into this new model of camp and way of registering. DUCC (Disciples of Christ and United Church of Christ Church Camp) is quickly filling up, in fact, we are ahead of where we were this time last year, so please make sure you are registering your kids! Don’t wait! 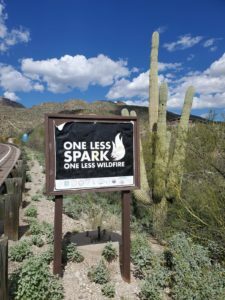 While this photo is warning us how we should be careful with fire in the wild, I was hit with this sign for another reason. It was another kind of warning to me: if we keep the spark that we know to be God’s love to ourselves, and never share it, we are unable to spark the wildfire of God’s love. This is especially true with our kids. So many parents today want kids to find their own way, and never encourage them to participate in a community of faith, leaving them to be brought up not by a community of love, but by the voices of the outside world that tells them that they aren’t good enough, that they aren’t attractive, and that they aren’t worthy of being loved. At camp, our kids are not allowed to have their phones. This keeps them from distracted by the endless texts, or scrolling through Instagram, and keeps them focused on the community they are a part of. Where they are taught about God’s love and the love of a community of faith. We can let the wildfire of negativity take over our children, or we can let the wildfire of God’s love reign in our kid’s hearts. So help spark the fire of God’s love in a kid’s life and encourage them to come to camp!